Meds: All taken daily – prenatal vitamin, Omega 3 + DHA, Ranitidine (2x/day), Magnesium (1000mg at bedtime), Gaviscon for heartburn as required (which is OFTEN!). Note: I tried to switch from Ranitidine to the Licorice Root yesterday. I also ate some dairy last night which usually triggers my acid reflux. Anyway, the switch didn’t go over well. I was up most of the night, so I’m caved and refilled my Ranitidine. Looks like I’ll be on it til the end. Baby is the size of: a WATERMELON! My husband’s workplace starting a baby pool. Right now, the most popular guesses for his arrival are: October 9 and 13. Having lunch with 2 of my local IVF friends today. It was so nice to catch up and sometimes I feel like it’s easier to talk about pregnancy and motherhood with people who have been through infertility. Total Weight Gain: a total of 16.6 lbs – didn’t weigh myself this week. 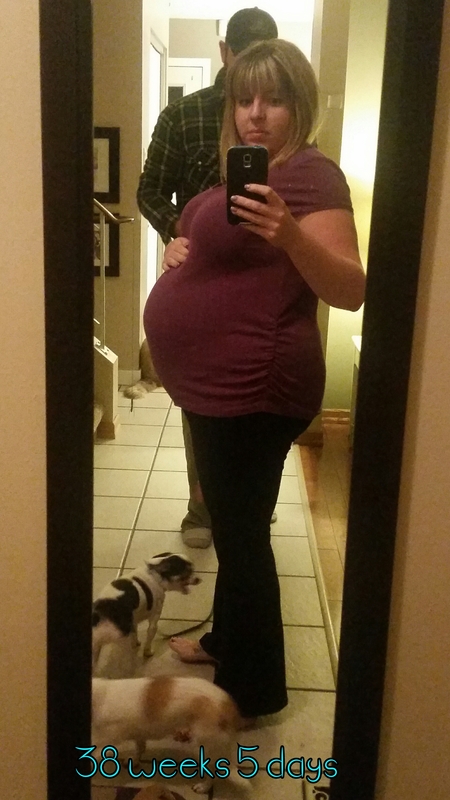 Maternity Clothes: All day, every day! After the 2.5km walk on Saturday, my SI joint was out of line again. Overall, my back is sore at night, but daytime is much more manageable. Tired. Oh, so tired. Fortunately, I squeezed in a 2 hour nap this afternoon. Insomnia. Yup, I randomly wake up between 3-4am every morning. If I can’t go back to sleep, I just get up and do something until I’m ready to sleep again (usually around 5-6am). Sleep: Still up every 1-1.5 hours to pee. Super uncomfortable. Difficult to get out of bed. Anything making you queasy or sick: And the puking has returned… I’ve puked a couple times in the mornings lately and woken myself up in the middle of the night coughing and choking. I run to the bathroom and puke my guts out. It’s lovely. As a result, I’ve really tried to eat a MUCH smaller supper (almost like a snack). I puked Chinese food on Sunday night and let’s just say I won’t be eating Ginger Beef for quite some time. Movement: He’s active on and off throughout the day. On the weekend, he was down in my pelvis and up in my ribs. I also find when I get a Braxton Hick contraction it hurts where his bum is. It’s almost like my skin doesn’t have any more give there. Stretch Marks: Yes, I’ve got tiger stripes. 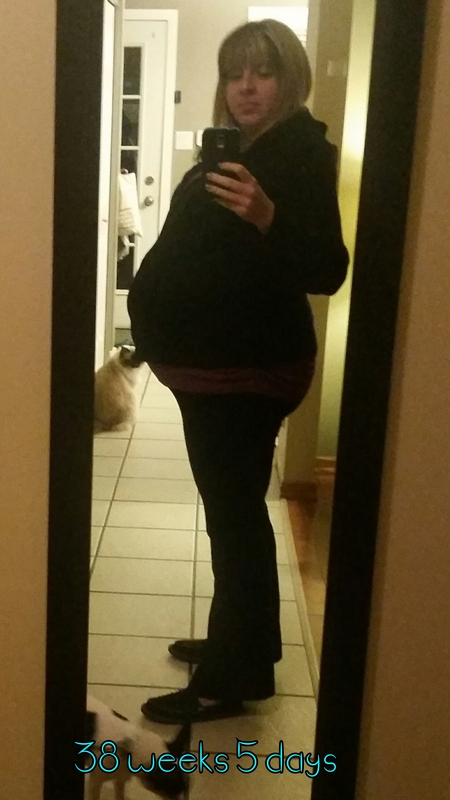 Baby Bump: Growing and growing… Took these photos tonight before we went for a walk. I’m proud to say that black hoodie is a regular sized hoodie. It was always a bit big on me, but it’s the only one I have that I can still squeeze around my belly and zip up. Labour Signs: Lots of Braxton Hicks. Random cervical pressure. After the walk on Saturday, I had some thick yellow mucous discharge, but nothing since. I think he dropped lower again last night. Belly Button In or Out? : Innie, but not much left. Wedding Rings on or off? : Off. Happy or Moody? : I’m in a neutral mood. Just sort of passing the time until he arrives. I do get grumpy if I’m tired, but overall, I’m decent. 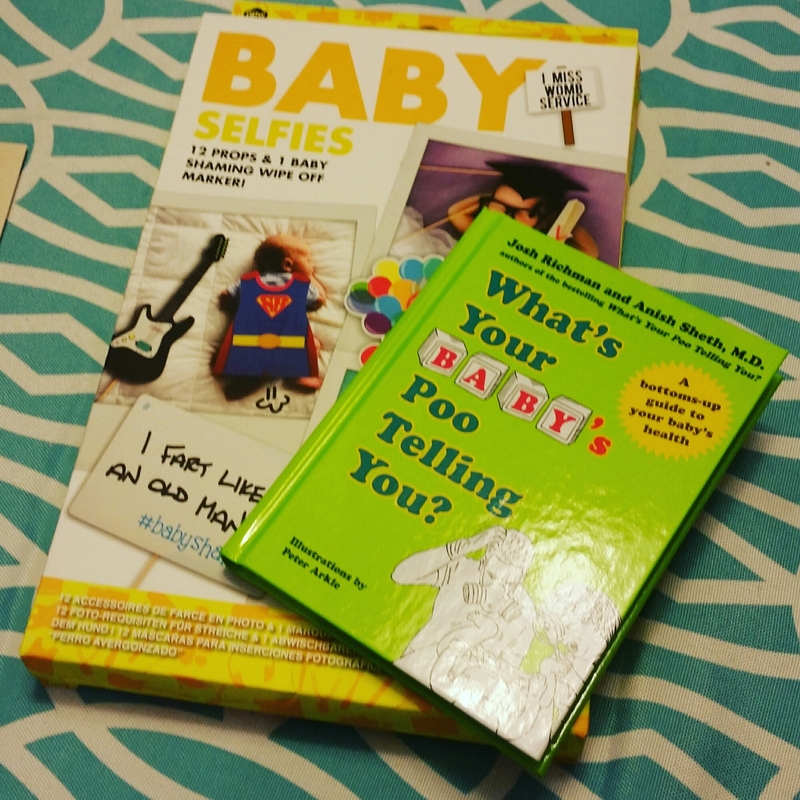 Received a few more gifts – a book, blankets, dish set, gift card to a local baby store, baby selfies kit, baby bath set. Looking forward to: The actual arrival of our little man! I’m so ready for this. I actually don’t have anything planned for the rest of the week besides another acupuncture appointment. My plan is to relax, maybe catch up with a few friends and channel all of my energy into letting him know he is welcome to join us. How do you honour a loss while celebrating a new addition? 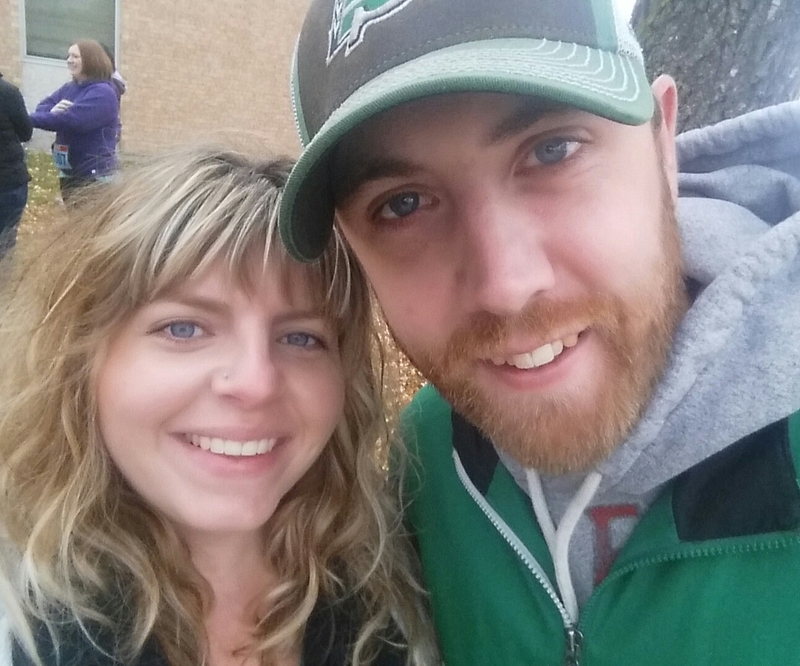 Lately, I’ve been thinking about how we can grieve/remember/honour the upcoming anniversary of the loss of our first child while celebrating the birth of our second child. These two emotions are such opposites. Yet for someone who has faced infertility and pregnancy loss and is transitioning into the state of parenting a baby earth-side, these emotions can be very much experienced at the same time. How do you explain that to someone who will not acknowledge your loss in the first place? You don’t… or you do so without expectation. Earlier tonight, I read a post by Sondra from A Calm Persistence about the importance of seeking support. In her post, the lesson that stood out the most for me was to seek support where it’s most likely to be given in a positive way. I know I spent too much of my own journey looking for support from the wrong people. Once you find the people who “get it”, the journey overall seems a bit easier. When I speak about my ectopic pregnancy, it’s easy to hide the grief. It’s easy to put aside all of the emotions that are tied into loosing a child and simply focus on the medical procedure and consequential outcomes. But when I speak of Emme, I can’t hide my grief. My voice cracks. My eyes tear up. My wounds within my heart are visible for all to see. She existed. She is our daughter… even if she isn’t with us now. Still, that concept remains hard for so many people to grasp. They prefer to ignore it rather than work through their own awkwardness into a place of compassion and understanding. My grief is normal, healthy and common. The infertility and pregnancy loss community has shown me that. I don’t have a plan for this upcoming Wednesday except that I don’t want to take myself back to the memories of the night we lost Emme. The fear. The sadness. The aloneness. Instead, I want to honour the beauty Emme has brought into our lives, the reassurance I have knowing she is watching over us and the gift that she gave us through her passing – her little brother. I won’t hide my grief. I won’t hide my joy. I’ve chosen to share them both. Because I know there’s another woman out there experiencing the same feelings as I am. Oh pregnancy insomnia! Once again, it’s 3 am and I’m wide awake. I decided to just get up instead of fighting it. I typically will go back to sleep in an hour or two. Not much to report on baby’s pending arrival. Thursday after my sweep, I had some brown spotting and very light cramps. I went to acupuncture on Friday morning. My acupuncturist agreed to start working on the induction points past 38 weeks, but said she would ease slowly into it. It must have done something because I had brown spotting, increased vaginal discharge (thick mucous – almost like ovulation time) and a consistent on and off again pressure in my cervix all Friday night. I was convinced I would wake up Saturday morning and be in labour. I even finished packing my hospital bag before I went to sleep. The pressure was decent enough that it even woke me up. Come Saturday morning, everything was back to normal. No signs of oncoming labour. 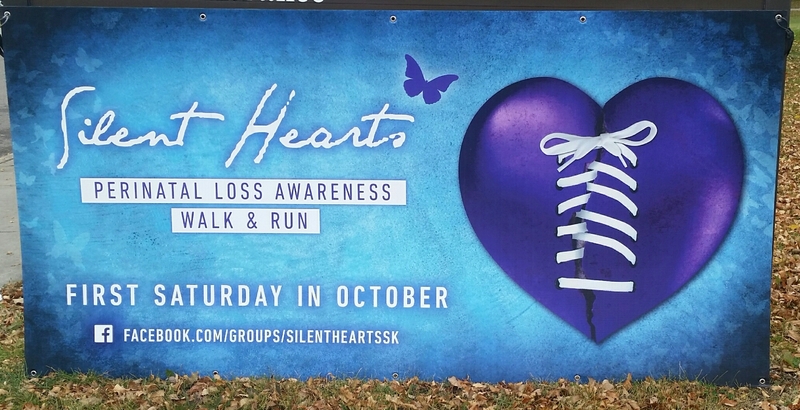 Yesterday, we attended our local Silent Hearts Perinatal Loss Awareness walk. It was a crap day – cold, rainy and windy, but we toughed it out. I made it through the 2.5km walk. Surprisingly, my pelvic pain has lessened but my SI joint was acting up during the walk (and still is… ugh). I had quite a bit of SI joint pain during the walk and some braxton hicks. Afterwards, I had increased vaginal discharge (almost thick and yellowish), but it stopped fairly quick. No other labour signs or symptoms. I was really hoping the long walk would encourage him to vacate the premises. I’m thinking baby boy is comfortable in there. Overall, it was quite the family event. Many people were gathered with their children, parents, grandparents and friends. I was surprised at how many people I recognized even. 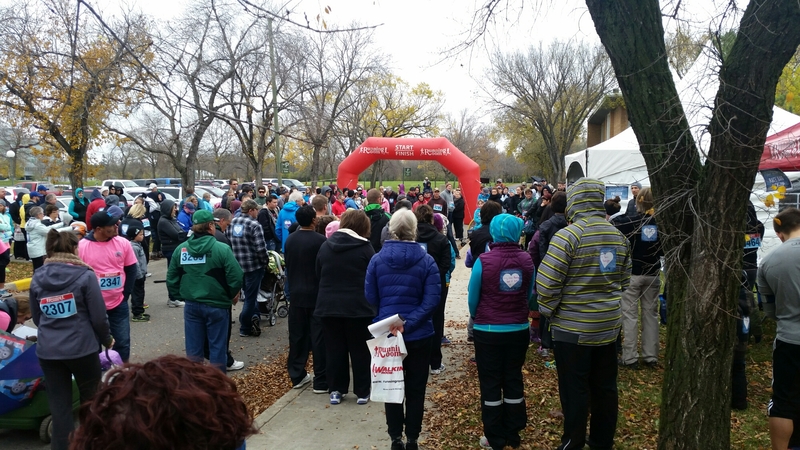 I may have been the largest pregnant woman there, but I wasn’t the only pregnant woman which helped ease my worry about feeling awkward at 38.5 weeks pregnant at a pregnancy loss awareness walk. 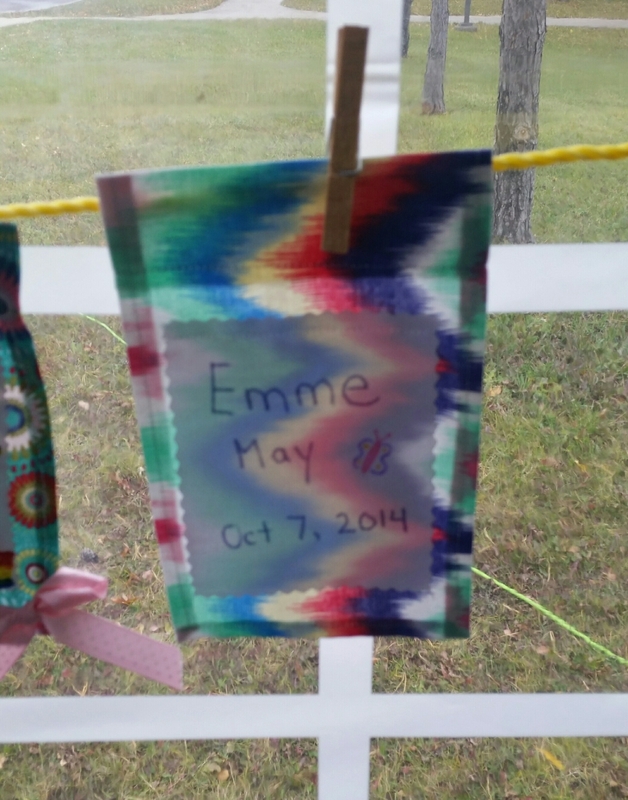 I didn’t get emotional until I wrote our daughter’s name on our prayer flag. They were just beautiful. In the end, we skipped the closing ceremonies. We had a family supper to attend and I needed to sit down. It was a nice celebration and I would consider going again especially if the weather is nicer next year. My husband has been very considerate this past week. I contemplated not going to the walk due to the weather, but he insisted that at least one of us attend because “she deserves it“. He even offered to go for us, but I knew it was something we had to do together. It meant a lot to me that he not only referred to her as she, but that he also saw the significance and importance behind the event. My MIL texted my husband asking what we were up to yesterday. When he mentioned that we were going to the loss awareness walk, she just didn’t respond. I DON’T GET IT. Those are the times you should say something comforting, perhaps even offer to join us? Oh well. I’ve just accepted that they will never truly acknowledge our daughter. I do think my husband is having a hard time with it though. We had a conversation last night about how their actions aren’t a reflection of the person he is. I’m so proud of who he is and our little family. I just returned from my 38 week OB appointment. The good news is that receptionist that I struggled with earlier on in my pregnancy has left the practise. His wife is temporarily doing the reception duties and she’s such a nice lady. Overall, things are going well. My Strep B swab came back negative! Whohoo! Blood pressure is still good. I have minimal to no swelling. My iron is still really low though. Once my bowels started moving better earlier this week, I finally caved and started taking my iron pills every other day. Hopefully that will help a bit before delivery. He wanted to wait until the next appointment to do a cervical check, but I insisted that he check today. I’m currently 1-2 cm dilated and 40% effaced… which at this point means pretty much nothing. Could be days or could be weeks. I also had the membrane sweep done. Surprisingly, it didn’t hurt as much as I thought it would. Baby is low and in the right position. The unfortunate news is my OB is away at a conference next week. Due to his lack of availability, my next appointment isn’t until 40 weeks, 1 day. He doesn’t seem concerned since I’m showing no reason to be. He also joked that I need to hold off until he’s back to have the baby. So, that’s where things are at. I plan to focus more on natural induction methods over the next week and see if that results in any progress. Let’s get this baby moving! Mommy and Daddy are ready to meet you! As I’ve mentioned before, I have a set of birth preferences for medical intervention during my labour and delivery. My husband and I also have set some boundaries with family and friends. During labour, we really don’t want anyone with us except our doula. I’ve also decided that I may not let anyone know when I’ve gone into labour or headed to the hospital. My family can be quite overwhelming when there is excitement happening (translation: my dad will send 20 text messages in 5 minutes). I don’t want family distracting us and nagging for updates. My MIL mentioned that she was willing to come and sit in the waiting room in Labour and Delivery to provide support to my husband. She didn’t realize we have a doula (which is a whole other topic), but my husband declined her offer. I’ve always wanted my labour experience to be a special moment between my husband and I. Even before we started trying to conceive, I never envisioned having a friend or even my own mother there. As for visitation after birth, we aren’t sure if we will allow visitors at the hospital. If all goes well, we hope to be discharged within 24 hours. We’ d like to take that time as a family to bond with our son, get started comfortably with breastfeeding and prepare for coming home. Right now, we’ve told local family and friends that we will let them know when they can come meet the baby, but that it may not be until we are settled at home. My husband is a bit worried that a few people may just show up. I agree with him that if we aren’t allowing his parents to see the baby right away that we shouldn’t allow anyone else to either. I just hope that people respect our wishes and we will be communicating them to the nursing staff. If we change our minds, we change our minds. If baby is doing well and I’m feeling comfortable breastfeeding, we may call up family to come by for a quick visit. But for now, we’d like our privacy to enjoy the first day of our son’s life with him.